A zinc-topped bar attached to the Ace Hotel’s Northwest flagship via a covert back ramp, Clyde Common is the main muddling ground for one of Portland’s best-known bartenders. Jeffrey Morgenthaler, who wrote the book on bartending technique, has used this perch well, establishing himself as a leader in barrel-aged cocktails, with a roster of signature drinks big enough to merit a spin-off —Pepe Le Moko debuted in the Ace’s basement earlier this year. On busy nights, the chic clientele stacked three-deep at the bar, sipping cocktails tart from lemon juice — the Bourbon Renewal — or frothy from egg white — the Formosa Sour. Clyde’s bartenders take craft seriously, though never at the expense of a good time. This is the rarest of cocktail bars: A worthy destination for mixology nerds that also seems like a pretty good idea anytime you’re in the neighborhood. Who’s sitting next to you? A woman in a turquoise mini-dress about three sips from being cut off. The signature drink: The OG barrel-aged Negroni, a mellow take on the classic Campari cocktail. Walk in off Northeast Broadway, cross Hale Pele’s little bridge and enter an exotic world illuminated by colorful hanging pufferfish, the sound of thunder emanating from above, a wisp of “volcano” smoke lingering in the air, all cloaked behind a strip-mall façade. Owner Blair Reynolds one-ups his cocktail peers through the degree of difficulty: With so much rum and fruit juice, it’s easy for tiki drinks to cascade toward the sickly sweet. But the masterly touch behind the bar ensures balanced, luscious sips — frosty lava flows with a bright-red ribbon of strawberry cordial; classic mai tais topped with a mint-scented mountain of crushed ice; the Fugu for Two, a recipe that originated at the Bay Area’s Forbidden Island and arrives here in a Munktiki mug with flavors of gold rum, passion fruit, pineapple and a hint of apricot. Like the bar itself, it’s mysterious, alluring and rum-soaked. Doing tiki right is a difficult task. Hale Pele makes it look easy. Who’s sitting next to you? Bearded hipsters not afraid to look uncool maneuvering oversized straws into a flaming volcano bowl. 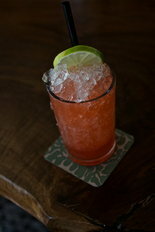 Signature drink: The potent Zombie, with its undercurrents of grapefruit and cinnamon. Imperial, Vitaly Paley’s downtown Portland restaurant, is built around the bar — literally. It’s the first thing you see when you walk in the door, with its towering cathedral of spirits arranged on mirrored shelves above tinctures, bitters and a growing collection of savory infusions (caraway vodka, anyone?). Guests from the adjacent Hotel Lucia queue up at the concrete bar, where bar manager Brandon Wise has honed a drinks menu dotted with carbonate-as-you-wait libations and complex, cleverly-named cocktails. Drink a refreshing, radish-inspired sipper with a hand-cut ice cube (see below) with a few small plates from the wood-fired kitchen in back, or dip the tip of your nose into the Trailblazer, with its Random’s Old Tom Gin and hard-shaken egg white hiding hints of pine and sage. Who’s sitting next to you? Casually dressed tourists and cocktail buffs. The signature drink: A Radish Walks Into a Bar, a hearty refresher inspired by Paley’s “Iron Chef” Battle Radishes victory. 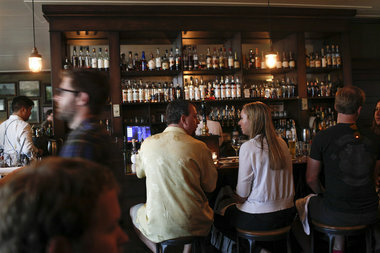 Unlike those bars playing “let’s pretend its the 1880s,” Kask manages to nod to the past without being stuck there. Old kitchen scales and vintage beer cans decorate the intimate space, but the cocktails are anything but dusty antiques. Sure, the menu notes the Fish House Punch dates to 1732, but the bartender insists they take liberties, bringing a more modern flavor profile to classic recipes. The Boot Strap Buck is an amped-up Dark N Stormy with blackstrap rum and ginger beer. The exceptionally smooth, gin-fueled Delilah feels like an homage to the Clover Club, the raspberry syrup upgraded to a shrub, a drinking vinegar that adds depth; the egg white brings creaminess, an age-old trick. This offshoot of Grüner refers to itself as “modern saloon,” a contrast to the Alpine embrace of its big sibling. The drink list comes divided by spirit, then halved into stirred and shaken. From the latter, try an El Diablo, a Trader Vic drink from the 1940s, with silver tequila, lime, creme de cassis and a mix of seltzer and house ginger syrup. Who’s sitting next to you? A couple sipping cocktails on what appears to be their first stop on date night. Signature drink: Maybe it’s the two-wheeled nomenclature, maybe it’s the blend of three trendy ingredients. Either way, the Bicycles & Baskets, with its whiskey, elderflower liqueur and Aperol, is among Kask’s most popular drinks. 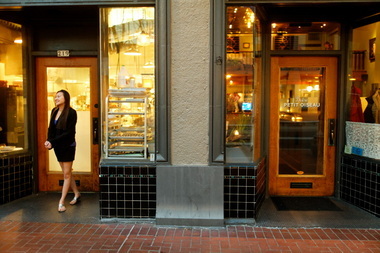 During the day, Little Bird, the downtown Portland bistro, offers a refined pit-stop for a quick lunch and a glass of wine. At night, the copper-topped bar nestled underneath the restaurant’s second floor balcony becomes a cozy after-work and later-night cocktail bar (the shakers stop shaking at midnight). Tom Lindstedt’s spirits-foward menu offers a cocktail for all tastes, from the sweet, pretty-in-pink Southern Rhone Comfort — French rosé, peach liqueur, bourbon and verjus (an acidic juice made from pressed, unripe grapes) — to the dark and handsome Manhattan Nouveau, which dresses up the classic with Bénédictine and Bordeaux. Wherever you’re sitting in the restaurant, make sure to grab a bite to eat, too. The French fare is among the best in town. Who’s sitting next to you? 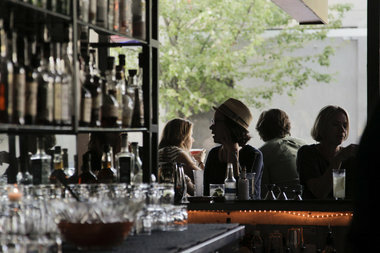 After-work tipplers, mid-30s chic diners and regulars known by name. Signature drink: The Manhattan Nouveau, a suaver take on the classic Manhattan which switches out vermouth for Bénédictine, an herbal liqueur. When cocktail guru Lucy Brennan opened the cocktail hotspot Mint in 2001, there was so much demand for her spirited elixirs that the place suffered a bit of an identity crisis: Was it a restaurant, a bar or a boozy nightclub? When the sleek lounge 820 opened two years later, things coalesced, with each side of the business finding its rhythm. More than a decade later, the quality of the cooking goes up and down, but the bar continues to have plenty of fresh ideas, while shaking up drinks that have become house signatures, like the Ad Lib, featuring vodka muddled with cilantro and lemon-lime juice. With only three beers on tap, why one is devoted to low-brow Tecate is a mystery. But this is a cocktail spot, not a beer hall. Coming to Mint/820 and not having a mixed drink misses the point. Who’s sitting next to you? Once a haven for twenty-something hipsters, the clientele has aged with the bar — not a bad thing. Signature drink: The Avocado Daiquiri, with blended rum, avocado slices, cream and freshly squeezed lemon and lime juice. Quietly located up the stairs at Raven & Rose, the restaurant inside the historic Ladd Carriage House, the Rookery is part leathery elegance, part barrel-filled country saloon. Old-time musicians pluck banjos and slap washboards twice a week, even as a pair of TVs tuned to Netflix subvert the sepia illusion. The classic cocktails come with modern finesse: lime nicely softens the “Navy Strength” gin and tonic while the Sim’s Old Fashioned, a tribute to the Reed College founder — “and Portland’s best-dressed bartender of the 1860s,” the menu notes — arrives with a block of impervious ice that doesn’t seem to melt a drop. The bar feels like a posh, downtown take on the shabby-chic, Americana-adoring watering holes that dot the eastside, though it has loyalties on both sides of the Atlantic. While the soundtrack is country-western, the comfort-food menu taps British favorites: a minor identity crisis, though nothing a few drinks can’t fix. Who’s sitting next to you? Dressy office escapees catching an after-work drink, perhaps before walking down to a show at the Schnitz. 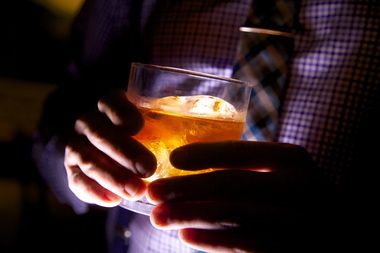 Signature drink: A selection from the handful of single-barrel spirits hand-picked and bottled for the bar. 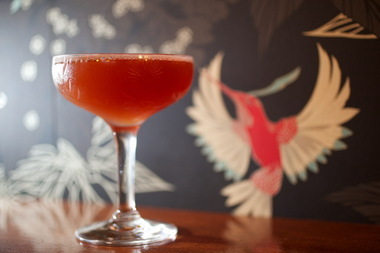 After three years, Rum Club has turned the corner from buzzy to beloved. This is where the restaurant industry goes after work. It’s where the city’s rockstar bartenders come to play. And it’s where the rest of us go for craft cocktails without pretension. It’s loud, laid-back, open late (until 2 a.m.) and the drinks don’t gouge (most are $8) — the perfect brainchild of former Doug Fir Lounge bar manager Michael Shea. An outstanding rum collection anchors the bar, and the perfectly balanced drinks are designed to show it off. Think tropical instead of tiki: Mai Tais served in coupes, profligate use of bitters instead of too-sweet syrups. Bar snacks like pickled eggs and chile-lime nuts mingle on the menu with steak and chimichurri sandwiches. In summer, sip swizzles on the patio, where vines have finally grown big enough to screen out the Sandy Boulevard traffic. In winter, drinks get spicier and the bar takes on a cozy glow, the lovely birds-of-paradise wallpaper reminding you that you’re back where you want to be. Who’s sitting next to you? A pair of bold-named bartenders down from Seattle for the day. Signature drink: The Rum Club Daiquiri, served up with an ingenious dash of absinthe, is about as far from those flair-bar slushies as you can get. Coffee frontiersman Duane Sorenson’s first foray into the restaurant game debuted, three years ago, as a fully realized vision of dark wood and bourbon, its patina rich enough to make some 50-year-old bars jealous. Walk into the candlelit dining room and turn right at the pile of craggy oysters nestled in sparkly ice, a deep-sea treasure chest fronting a bar stocked with showy bourbons and real ales on the pump. The cocktail list, crafted by original bar manager Evan Zimmerman, who recently left the Woodsman (his able-bodied replacement is Ed Villareal), has been a consistent delight, from clever spins on classics to a memorable egg-white and edible-flower cocktail that resembled a surrealist terrarium. I swear, one night they served me a cocktail with a cube of charred ice: one part mad genius, one part “Portlandia” parody, add bitters and stir. Signature drink: These days, it’s the Kentucky Special, a mix of bourbon, cherry Heering and smoky lapsang souchong tea; or, if money is no object, pick from the Pappy Van Winke vertical displayed on the top shelf. 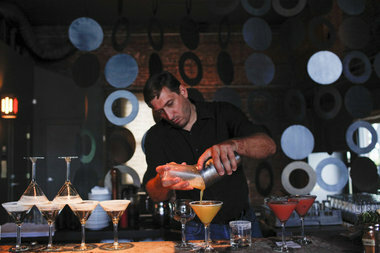 Teardrop professes its love of the Golden Era of Bartending on its website. For Portland, that era is today, and this Pearl District bar helped pave that path with its attention to technique, quality ingredients and eclectic recipe list. The menu divides into three equal parts: Originals (Love in the Afternoon: whiskey, pluot, lemon-basil soda), classics (1888 cobbler with amaro, orange, soda and fruit bouquet) and friends, drinks from prestigious American cocktail contemporaries (Zucca Sour from Chicago’s Violet Hour: Zucca rubarbaro, amaro, pineapple, lemon and egg white). It’s that latter category that best defines Teardrop’s mission: cocktail as community. 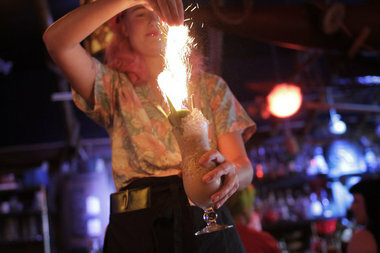 It’s happy to educate a legion of bartenders behind a circular bar decorated with candles, fruit bowls and bitters bottles, then send them out into the world — Teardrop’s mixologist ranks have helped staff many of Portland’s top cocktail bars. Catch the next group of prospects while you can. Who’s sitting next to you? Like the menu, it’s an eclectic mix. Signature drink: Teardrop’s piña colada is this summer’s biggest hit, bringing some nuance to a drink that’s usually sweet and straight-forward.